We are delighted to announce that we have acquired 11 Arthur Street Belfast on behalf of Seasalt Cornwall, their first store in Ireland. Fitting out works are well underway for an eagerly anticipated opening on Saturday 29 September 2018. The former Campbell’s coffee shop unit needed considerable alterations to create the new unit with a completely remodelled shopfront on the way. Working closely with Seasalt’s designers and the landlord, we’ve achieved an excellent result that will be a fantastic addition to Arthur Street, which has become the destination of choice for multiple national retailers in the City Centre. The Cornish fashion brand, established in 1981, produces beautiful women’s clothing, accessories and footwear, championing a simple and creative lifestyle in everything they do. The Seasalt team design their range from their studios overlooking the sea in Falmouth, a location that infuses the collections with an artistic, authentic Cornish feel. But it doesn’t end here. 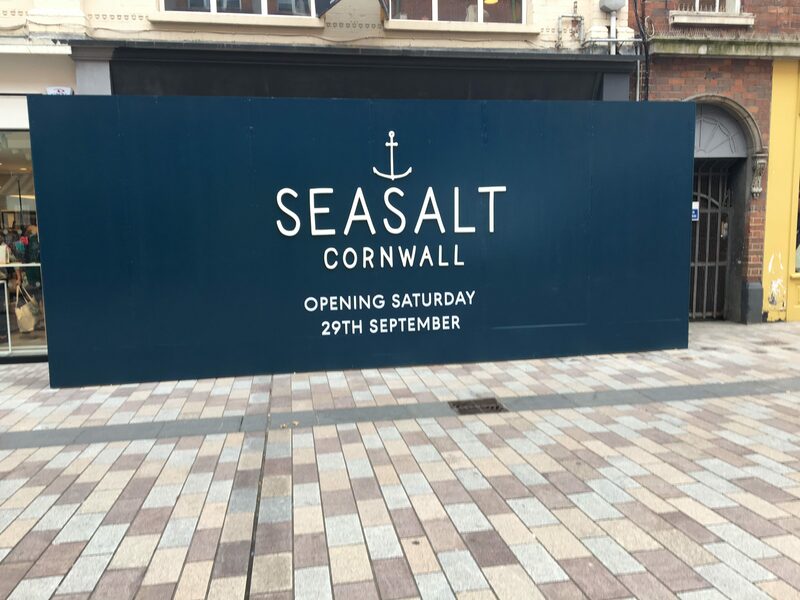 Seasalt intend to open several new stores in Ireland over the next couple of years in locations that, like Belfast, capture the spirit of their coastal heritage.